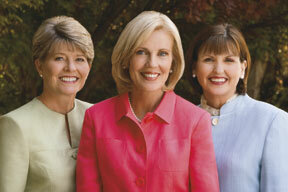 Top: Elaine S. Dalton (center); president; Mary N. Cook (left), first counselor; and Ann M. Dibb (right), second counselor. Have you ever wanted to make a difference in the world but didn’t know how to start? Have you wanted to stand up for something right but lacked courage because doing so might draw ridicule from your peers? This is the year to become the leader you were sent here to earth to be. Now, more than ever before, the world needs your light and your leadership. You can make a difference. The 2010 theme invites us to “be strong and of a good courage” (Joshua 1:9). Strength and courage are attributes of leaders. As a member of the Church, you are a leader in the cause of virtue and righteousness. “Great courage will be required as you remain chaste and virtuous amid the accepted thinking of the times. Your courage to lead will come as you live the standards, make correct choices, and follow the prophet. Your strength will come as you strive daily to increase your testimony of the Savior by praying and reading in the Book of Mormon. Your strength to lead others will come as you live the standards found in the booklet For the Strength of Youth. As you do these things, you will feel good about yourself. You will have confidence, and you will grow in spiritual strength. And don’t forget to smile! Have a positive attitude. “Let us cheerfully do all things that lie in our power; and then may we stand still, with the utmost assurance, to see the salvation of God” (D&C 123:17). Knowing what is right and wrong is always possible (see Moroni 7:16), and you are promised that the Holy Ghost will tell you “all things what ye should do” (2 Nephi 32:5). As you study, listen for the guidance of the still, small voice. You have the promised assurance that “by the power of the Holy Ghost ye may know the truth of all things” (Moroni 10:5). Whatever your circumstances, you were born to lead in your family, in your school, and in your community. So this year, be strong, have courage, and make a difference in the world! You are not alone. Heavenly Father will hear and answer your prayers and guide your actions as you remain pure and worthy of the constant companionship of the Holy Ghost. You are daughters of our Heavenly Father, who loves you. These are your days. We love you and pray that you will be strong and courageous in living the standards and leading out in the cause of virtue. Your righteous example will make a difference! Thomas S. Monson, “May You Have Courage,” Liahona and Ensign, May 2009, 125.